At the beginning of the ceremony, the audience was treated to music from the Amaro String Quartet. After assorted welcomes (Norman Anderson of APA, Patrick O'Neil of CPA, and Ester Cole of OPA), Dr. Robert Sternberg read a mayoral proclamation, proceeded to describe his priorities and vision, and outlined several initiatives he has launched. He spoke with wit and wisdom on the issue of defining "intelligence" and shared how he might himself have been a total failure rather than a Yale graduate and renowned scholar if he had continued to believe the results of his group IQ tests. Sternberg noted in passing how in the history of the APA, there have been only 2 cancelled conventions and they were both during World War II. I would add here that the president of the Canadian Psychological Association was quite charming and witty. He noted that "the times are a changin'" such that Canada was once thought of by its neighbors as "a boring place". But recently "there was a war and we decided not to attend, and a President decided not to come up and see us. And then we had SARS and a *lot* of people decided not to come up and see us. But then things changed... The Rolling Stones came up and things looked good!" And right now they find themselves at the center of a religious/gay rights dispute. Not a dull place any more! Point taken. Toronto is a nice city, clean, with friendly people... one of whom told me today I erred in my spelling of the well-known Canadian "ay" (as I wrote) -- it is properly spelled "eh". Mea culpa. And here are some final notes on little-known facts which Sternberg shared in his introductory remarks. For those who wonder where this expression came from, it was in fact George Miller who coined the slogan, "giving psychology away", referring to the importance of promoting and sharing our cumulative knowledge with the general public. And the Celtic instruments played were a uillean pipe chanter and drones. O.K., eh? 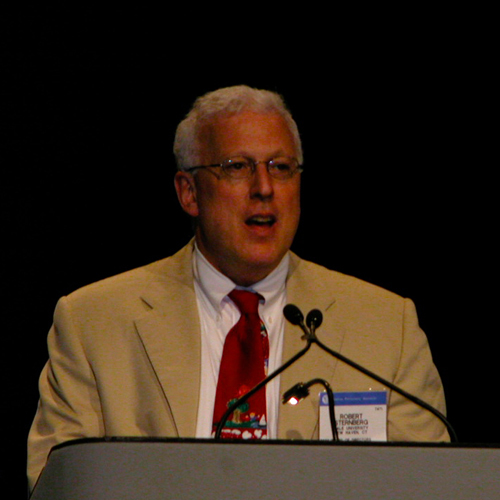 And now.... Robert Sternberg, pre-eminent Yale University scholar in the areas of intelligence, cognition, and love, and 2003 APA President. Dr. Sternberg said that his Presidential Theme has been, "We Should Unify", and he's been working with the organization's governance structure to make this happen. He's presented a proposal for a task force to bring together science in practice, and has a book coming out in 2004 (APA Press) entitled "Unifying Psychology". Sternberg is also concerned about more civility in peer reviews and public assessment of colleagues. He continues to be a determined advocate for "no more savage reviews -- including by us! ", noting the tendency to be uncivil at times, rather than polite, in reviewing others' work. "It is improper to attack authors rather than what's written", he said. Sternberg added that he has another new book he's writing titled "Reviewing in Psychology". Speaking of civility versus aggression, Sternberg shared that he has become generally more interested in the phenomenon of hate since the 1990's. He sees 3 primary components in the type of hatred which can consume whole regions and/or lead to the type of thinking commonly seen with "terrorists". Negation of intimacy: "The hated group is less than human.... vermin.... and one can't even imagine intimacy" with such people. This is the thing that hate propaganda tries to foment." Passion: "Unless you extinguish them.... it's us or them!" Cognitive commitment to hate: "You take over the young people's education and a new history is created." Sternberg added that "What I believe is that wise people don't hate". With that, he segued from propaganda to talking about other closed systems, such as education and IQ testing, which have not been entirely successful in creating wise people, or identifying them. Sternberg shared that his own motivation for studying intelligence and IQ so deeply was "motivation". His bias came, he said, from "doing poorly on group IQ tests". Like Zimbardo, he ribbed, he too only got a "C" in Intro to Psychology and had continuously low self-expectations. "Our society is squandering the talents of young people, to their detriment and to the detriment of society." Why? Because of many bright minds not even recognized, and perhaps mislabelled as very slow because of standard test scores, or " ...because they're not really good book memorizers or lecture memorizers". Yet he noted there surely is "lots of overlap between IQ and achievement". Sternberg went on to say that "closed systems work the same way, across societies, with family, religion, socially-defined race or ethnic group, and physical characteristics" (e.g., attractiveness and height). So, he concluded (tongue in cheek, demonstrating the lack of easy answer), "My own preference is to get away from all this subjective junk and go to height! [as a standard measure for potential in life] You can't cheat! If you wear elevator shoes you'll get caught. You can't *buy* your way in..." Please don't send him hate mail, height-challenged readers! He was joking to illustrate the difficulties with rigid standards! "We have to be very careful of the closed systems we create! So, [in his own school experience, doing poorly on group IQ tests], they treated me like a loser, so I acted like one. I was dumb, and everyone just thought that too." Now he has a new idea about testing for potential to be successful, which he dubbed "successful intelligence". "Successful intelligence is the ability to succeed in life, according to your own definition of success, within your sociocultural context". Next APA's award for outstanding lifetime contribution was given to George Miller, who was there to graciously accept it and again there was a musical interlude, this time featuring a fantastic folk music spectacle by the Maritime Dancers and Musicians ("Fig for a Kiss"). PS/PD Apologies for any typos... late at night and long days! Copyright © 2003-2011 Michael Fenichel. All Rights Reserved.